Rudolf Otto (25 September 1869 – 6 March 1937) was an eminent German Lutheran theologian, philosopher, and comparative religionist. He is regarded as one of the most influential scholars of religion in the early twentieth century and is best known for his concept of the numinous, a profound emotional experience he argued was at the heart of the world's religions. Born in Peine near Hanover, Otto was raised in a pious Christian family. He attended the Gymnasium Andreanum in Hildesheim and studied at the universities of Erlangen and Göttingen, where he wrote his dissertation on Martin Luther's understanding of the Holy Spirit (Die Anschauung von heiligen Geiste bei Luther: Eine historisch-dogmatische Untersuchung), and his habilitation on Kant (). By 1906, he held a position as extraordinary professor, and in 1910 he received an honorary doctorate from the University of Giessen. Otto's fascination with non-Christian religions was awakened during an extended trip from 1911-1912 through North Africa, Palestine, British India, China, Japan, and the United States. He cited a 1911 visit to a Moroccan synagogue as a key inspiration for theme of the Holy he would later develop. Otto became a member of the German parliament in 1913 and retained this position through the First World War. 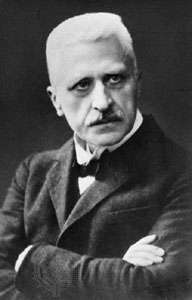 He then served in the post-war constituent assembly in 1918, and remained involved in the politics of the Weimar Republic. Meanwhile, in 1915, he became ordinary professor at the University of Breslau, and in 1917, at the University of Marburg's Divinity School, then one of the most famous Protestant seminaries in the world. Although he received several other calls, he remained in Marburg for the rest of his life. He retired in 1929 and died of pneumonia eight years later, after suffering serious injuries falling about twenty meters from a tower. Persistent but unconfirmed rumors identified this as a suicide attempt. He is buried in the Marburg cemetery. Otto's most famous work, The Idea of the Holy, was first published in German in 1917 as Das Heilige - Über das Irrationale in der Idee des Göttlichen und sein Verhältnis zum Rationalen. It is one of the most successful German theological books of the 20th century, has never gone out of print, and is now available in about 20 languages. The first English translation was published in 1923 under the title The Idea of the Holy: An Inquiry into the Non-Rational Factor in the Idea of the Divine and its Relation to the Rational. Otto was influenced by the rationalist approaches of Immanuel Kant and Jakob Fries, and he stated that his previous works had focused on the rational aspects of the divine. He felt people should first do serious rational study of God, before turning to the non-rational element of God as he did in this book. The book defines the concept of the holy as that which is numinous, a term Otto coined based on the Latin numen ("divine power"). (The term is etymologically unrelated to Immanuel Kant's noumenon, a Greek term referring to an unknowable reality underlying all things.) Otto explained the numinous as a "non-rational, non-sensory experience or feeling whose primary and immediate object is outside the self". This mental state "presents itself as ganz Andere, wholly other, a condition absolutely sui generis and incomparable whereby the human being finds himself utterly abashed." Otto argued that because the numinous is completely irreducible and sui generis it cannot be defined in terms of other concepts or experiences, and that the reader must therefore be "guided and led on by consideration and discussion of the matter through the ways of his own mind, until he reach the point at which 'the numinous' in him perforce begins to stir... In other words, our X cannot, strictly speaking, be taught, it can only be evoked, awakened in the mind". Otto devotes chapters 4 and 5 to attempting to evoke the character of the numinous and its various aspects. He describes it as a mystery (Latin: mysterium) that is simultaneously terrifying (tremendum) and fascinating (fascinans). According to Mark Wynn in the Stanford Encyclopedia of Philosophy, The Idea of the Holy falls within a paradigm in the philosophy of emotion in which emotions are seen as including an element of perception with intrinsic epistemic value that is neither mediated by thoughts nor simply a response to physiological factors. Otto therefore understands religious experience as having mind-independent phenomenological content rather than being an internal response to belief in a divine reality. Otto applied this model specifically to religious experiences, which he felt were qualitatively different from other emotions. Otto left a broad influence on theology and the philosophy of religion in the first half of the 20th century. In The Idea of the Holy and other works, he set out a paradigm for the study of religion that focused on the need to realize the religious as a non-reducible, original category in its own right. This paradigm was under much attack between approximately 1950 and 1990 but has made a strong comeback since then, as its phenomenological aspects have become more apparent. The eminent Romanian-American philosopher Mircea Eliade used the concepts from The Idea of the Holy as the starting point for his own 1957 book, The Sacred and the Profane. Carl Gustav Jung, the founder of analytic psychology, applied the concept of the numinous to psychology and psychotherapy, arguing it was therapeutic and brought greater self-understanding, and stating that to him religion was about a "careful and scrupulous observation... of the numinosum". Others to acknowledge Otto were, for instance, Martin Heidegger, Leo Strauss, John A. Sanford, Richard Rohr, Hans-Georg Gadamer (critical in his youth, respectful in his old age), Max Scheler, Ernst Jünger, Joseph Needham, W. T. Stace, Joachim Wach and Hans Jonas. Otto's ideas have also been discussed by Jewish thinkers including Joseph Soloveitchik and Eliezer Berkovits. Karl Barth, an influential Protestant theologian contemporary to Otto, acknowledged Otto's influence and approved a similar conception of God, as totaliter aliter, and aliud, aliud valde ("other, completely other"), the latter phrase being taken from Augustine of Hippo's Confessions (7.10.16). Otto was also one of the very few modern theologians to whom C. S. Lewis indicates a debt, particularly to the idea of the numinous in The Problem of Pain. German-American theologian Paul Tillich acknowledged Otto's influence on him, as did Otto's most famous German pupil Gustav Mensching (1901–1978) from Bonn University. More recently, Otto's views can be seen in Karl Rahner's presentation of man as a being of transcendence. ↑ Adler, Joseph. "Rudolf Otto's Concept of the Numinous". Kenyon College. Retrieved 19 October 2016. 1 2 "Louis Karl Rudolf Otto Facts". YourDictionary.com. Encyclopedia of World Biography. Retrieved 24 October 2016. 1 2 3 Meland, Bernard. "Rudolf Otto | German philosopher and theologian". Encyclopaedia Britannica Online. Retrieved 24 October 2016. ↑ Lindsay Jones (ed. in chief). Encyclopedia Of Religion: Second Edition. Thomson Gale, 2005, p. 6926. ISBN 0-02-865743-8. 1 2 Ross, Kelley. "Rudolf Otto (1869-1937)". Retrieved 19 October 2016. ↑ Eckardt, Alice L.; Eckardt, A. Roy (July 1980). "The Holocaust and the Enigma of Uniqueness: A Philosophical Effort at Practical Clarification". Annals of the American Academy of Political and Social Science. Sage Publications. 450 (1): 165–178. doi:10.1177/000271628045000114. JSTOR 1042566. P. 169. Cited in: Cohn-Sherbok, Dan, ed. (1991). A Traditional Quest. Essays in Honour of Louis Jacobs. London: Continuum International Publishing Group. p. 54. ISBN 978-0-567-52728-8. ISBN 0-56752728-X. ↑ Otto, Rudolf (1923). The Idea of the Holy. Oxford University Press. p. 7. ISBN 0-19-500210-5. Retrieved 19 October 2016. ↑ Otto, Rudolf H. (1996). Alles, Gregory D., ed. Autobiographical and Social Essays. Berlin: Walter de Gruyter. ISBN 978-3-110-14519-9. ISBN 3-11014519-7. mysterium tremendum et fascinans. ↑ Wynn, Mark. "Phenomenology of Religion". Stanford Encyclopedia of Philosophy. Center for the Study of Language and Information, Stanford University. Retrieved 1 November 2016. ↑ Agnel, Aimé. "Numinous (Analytical Psychology)". Encyclopedia.com. International Dictionary of Psychoanalysis. Retrieved 9 November 2016. ↑ Eliezer Berkovits, God, Man and History, 2004, pp. 166, 170. ↑ Webb, Stephen H. (1991). Re-figuring Theology. The Rhetoric of Karl Barth. Albany, New York: SUNY Press. p. 87. ISBN 978-1-438-42347-0. ISBN 1-43842347-0. ↑ Vessey, Mark, ed. (2012). A Companion to Augustine. Hoboken, New Jersey: John Wiley & Sons. p. 107. ISBN 978-1-405-15946-3. ISBN 1-40515946-4. Almond, Philip C., 'Rudolf Otto: An Introduction to his Philosophical Theology' (Chapel Hill: University of North Carolina Press, 1984). Gooch, Todd A, The Numinous and Modernity: An Interpretation of Rudolf Otto's Philosophy of Religion. Preface by Otto Kaiser and Wolfgang Drechsler. (Berlin and New York: Walter de Gruyter, 2000). ISBN 3-11-016799-9. Mok, Daniël (2012). Rudolf Otto: Een kleine biografie. Preface by Gerardus van der Leeuw. Amsterdam: Uitgeverij Abraxas. ISBN 978-90-79133-08-6. Mok, Daniël et al. (2002). Een wijze uit het westen: Beschouwingen over Rudolf Otto. Preface by Rudolph Boeke. Amsterdam: De Appelbloesem Pers (i.e. Uitgeverij Abraxas). ISBN 90-70459-36-1 (print), 978-90-79133-00-0 (e-Book).